In the days of communism’s fierce grip on the Soviet Union, there lived a chassidic Jew named Reb Mendel Futerfas. Reb Mendel repeatedly put his life at risk with his efforts to promote Jewish education behind the Iron Curtain, and for some 14 years was incarcerated in prisons and labor camps for his “crime” of teaching Torah. While in the Siberian gulag, he spent most of his free time studying and praying, but he also interacted and conversed with other prisoners—some Jewish, some not. Among these prisoners was a circus performer whose claim to fame was his incredible skill as a tightrope walker. “To just go out there and walk on a rope?” Reb Mendel challenged incredulously. The performer explained that due to his training and skill he did not need to be held up by any cables, and that for him it was no longer all that dangerous. Reb Mendel remained skeptical and intrigued. After Stalin died, the prison authorities relaxed their rules somewhat, and the guards told the prisoners that they would be allowed to stage a makeshift circus on May Day. There was no doubt that the famous tightrope walker’s act would be the highlight of the show. The tightrope walker made sure that his friend, Reb Mendel, was in the audience. Everyone watched with bated breath as the tightrope walker climbed the tall pole to the suspended rope. His first steps were timid and tentative (after all, it had been several years), but within a few seconds it all came back to him. With his hands twirling about, he virtually glided across the rope to the pole at the other end, and then, in a flash, made a fast turn, reversed his direction and proceeded back to the other side. Along the way, he performed several stunts. The crowd went wild. “Okay. You’re a smart man. Tell me, how did I do it? Was it my hands? Was it my feet?” the man asked. This week’s Torah reading, in which we learn about the events that transpired on the last day of Moses’ life on earth, is called “And Moses went” (Vayeilech Moshe). The commentaries point out that even on the last day of his life, Moses was on the move—walking forward, achieving, growing—making the most of every precious moment of life. Moses’ message to us is that so long as we have a breath of life, there ought to be vayeilech—explorations of new horizons, journeys to new frontiers. 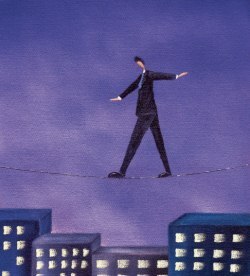 How do we walk this tightrope called “life” without stumbling? The answer is: by establishing clear and proper goals, and remaining focused on those goals like a laser beam. The Torah provides us with a roadmap to a meaningful and fulfilling way of life. It sets down goals, and defines purpose. It is also noteworthy that this Torah reading is often read on the special Shabbat that serves as the bridge between Rosh Hashanah and Yom Kippur, referred to as “Shabbat Shuvah.” On that Shabbat we also read a haftorah in which we hear the words of the prophets exhorting us, pleading with us, beckoning us to improve the quality of our lives; to even change direction, if need be. When you know what your purpose and destination is, and you do not take your eyes off that pole, then you know where to put your feet. Even when things turn, and we momentarily lose sight of the pole, we need not despair. Shabbat Shuvah teaches us that a change of direction ought not to send us plummeting. On the contrary, we can and should shift gracefully with changes of circumstances, catch our balance, and let the next pole come into view. Rabbi Moshe Bryski is executive director of Chabad of Agoura Hills and dean of the Conejo Jewish Academy. If a Ceiling Could Talk . . .
How Valuable Is It To Live As If Every Day Were Your Last?